When it comes to aging, it seems that everyone does it differently. 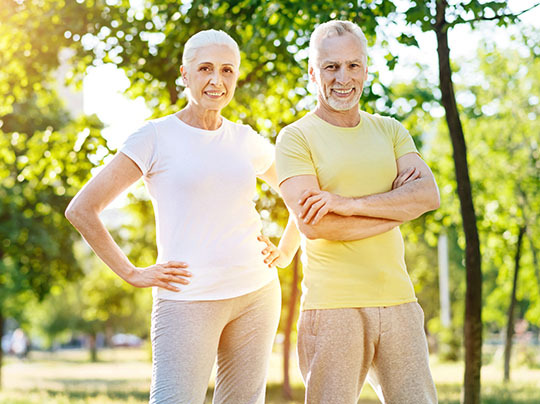 We all know people in their 80s and 90s who are much more active and energetic than their years would suggest. At the same time, there are many people who seem elderly and tired out who are decades younger. Is this difference due to genetics, lifestyle, mindset, or all of the above? Or is it something else entirely? Certainly the genetic hand that you’ve been dealt plays a role in your overall health and how well you will fare in your later years. However, there has been much research lately in the area of something called Epigenetics, in which the expression of certain aspects of your genetic makeup is affected by outside factors. Essentially, your lifestyle, environment, and emotional outlook can have an impact on how your genes are expressed and your overall health. The concept of aging in Chinese medicine is similar to the cutting edge theory behind Epigenetics. It goes something like this: Your overall body constitution is determined by your Essence, which is a vital substance that you have at birth, called Pre-Natal Essence. This Essence affects how you grow, mature, age, fertility, and how healthy you will be in general. This Essence becomes depleted as you grow older, but it can also be depleted prematurely by poor lifestyle choices. When the Essence you were born with is completely exhausted, you will die. There’s a twist, however, in that you also have a secondary type of Essence, called Post-Natal Essence. This secondary Essence can protect your Pre-Natal Essence and keep it from becoming depleted prematurely. Similar to the idea of using your checking account to protect your savings, you can beef up Post-Natal Essence through good diet and living moderately to protect your Pre-Natal Essence. -Get enough rest in the form of sleep or down time. It takes energy for your body to heal and rejuvenate, and that happens while you’re sleeping. Give your body the time it needs to recover from the day’s stresses. -Exercise Regularly. At the same time, you need to counterbalance your rest with work in the form of physical activity. Exercise is crucial when it comes to aging well. It strengthens your muscles and bones, improves the health of your heart and lungs, keeps your blood flowing efficiently, boosts immunity, and is good for your mental health. -Don't over-do it. Know that it’s possible to work too hard, to the point of ill health. In Chinese medicine they call this overworking, and it’s considered to be the cause of many ailments. It can come from too many hours at the office, studying too long, care-giving without a break, and even over-exercising. The key is to balance work and rest, and not get too much or too little of either. -Eat for the long haul. It’s true that the occasional trip through the fast food drive up window won’t kill you, but you can bet that there aren’t many octogenarians who make it a regular habit. A simple guide for what to eat would be to choose real foods (not chemically enhanced), mostly plant based, and cooked at home, and you’ll be doing better than most. And while mixing up your diet may sound overwhelming, the reality is that making small dietary changes for the better can yield big results in your health. -Pay attention to your digestion. If you’re having any digestive symptoms like heartburn, stomachaches, gas, bloating, nausea, or bowel problems, chances are your body isn’t converting your food into nutrients very well. For better digestion, eat your vegetables cooked rather than raw, avoid lots of cold foods and drinks, avoid rich and greasy meals, slow down, and chew your food. If your symptoms persist, enlist the help of a practitioner of Chinese medicine. -Assess the stress. Unrelenting stress is one of the most damaging influence on your health and longevity. It affects everything including sleep, mental outlook, immunity, digestion, and inflammation. That’s because when you’re constantly in a state of high alert, your body shuts down those systems that you don’t need right in the moment to survive. When you take steps to deal with stressful situations and take time to relax, you move from a state of fight or flight to one of rest and digest. -Stay positive. Beyond stress, your outlook plays a huge role in the state of your health, too. Research indicates that people with a negative outlook have a shorter predicted lifespan. A sense of humor, feeling grateful, having something to look forward to, and being engaged with others in some way all fall into the positive column when it comes to aging healthfully. -Practice moderation in all things. While moderation may sound boring and safe, it may actually be a secret to living longer. When you ask people who have lived to be 100 about their secret to a long life, more often than not they will say they don’t have one. That’s most likely because they lived a life of moderation. The take away is that almost anything is okay as long as it’s done with a little self-control. -Listen to the messages that your body gives you. If you’re having symptoms such as sleep problems, headaches, an achy lower back, overwhelming fatigue, or an upset stomach, your body is trying to tell you something. Slow down, take stock, and listen. Your body knows what it needs and will send you signals when it’s in trouble—your job is to pay attention. So whether you were dealt a good genetic hand or one with some limitations, how you play it is most important. Whether it’s about preserving your Essence in Chinese medicine, or Epigenetics in Western medicine, the choices you make regarding your health can make a big difference in how you age. Want To Know The Secret To Healthy Aging? These 9 Simple Steps Will Show You! Follow these 9 simple steps for healthy aging using the time tested methods of Chinese medicine. The secret to natural anti aging starts with diet, exercise and rest. Next post: Having Trouble Breathing Because Of Asthma? Here Are 6 Natural Remedies That Will Help!